​Footballers and film. Let's face it, it's a match made in heaven. Thus, there is a vast reserve of roles from which to draw from. From minor cameos and personal portrayals to full blown character submersions, here is the definitive ranking of the top 12 film-related footballer endeavours. Trust us, we know the weight this holds in the culture, and we won't let you down - at least not as much as the Oscars. Honourable shout-outs go to Zinedine Zidane, Ronaldinho and (slightly less honourable) Alex Iwobi. A massive call to start the proceedings. ​Olivier Giroud's debut appearance on the silver screen hasn't even come out yet, and he's already being put alongside some of the greats of this fairly niche field. But it's a big role - Bouffon Vert, or Green Goblin as we know it - and from what we've seen in that very small announcement snippet, he looks the part. He's got big shoes to fill - including those of Academy Award nominee Willem Dafoe - but we're backing Olivier to bring it home. How could we have Giroud without the forebear of French footballing forays into the dubbed animated superhero world? I'm not going to lie, I haven't seen the original 'Lego Batman Movie', much less the French version. But from what I've seen on YouTube, the Atletico Madrid striker went full method for this one, and that should be rewarded. Stanislavski would be proud. Definitely the weirdest of the lot, and that's saying something. Obviously, I've never seen 'Torrente 4: Lethal Crisis' (or the three preceding films for that matter). But, having watched the clip with the Real Madrid lads in it (as well as Cesc Fabregas and ​Sergio Aguero apparently, although I can't see how that would fit in with the story arc), I definitely want to. I won't spoil it - all I'll say is they're playing themselves in Madrid kits, alongside some other randoms (who definitely aren't Madrid players, but I don't know whether they're supposed to be and the budget wouldn't stretch or if it's just part of the story), and ​Gonzalo Higu​ain gives the only lines of the group, in a breakout role. The only reason this transcends 'Torrente' is that Stan's cameo in this too woeful for words Basic Instinct sequel actually involved some acting. Collymore was charged with playing Kevin Franks - a real stretch - although not for long; he was chopped before the start of the credits. We would give you a snippet or snap from the film, but it's wildly inappropriate and wholly disturbing. So, we instead chose an image of Stan at a Southend United vs Northampton Town clash in 2004, wearing an LA Clippers jersey, which is just as inappropriate and disturbing. Such was the depravity of Guy Ritchie's needless King Arthur film, that David Beckham's strange appearance in the pivotal sword-pulling scene wasn't the worst moment. But that definitely doesn't mean it was good. Because it wasn't. It was weird, made very little sense and set the tone for the remaining five hundred hours of screen time. Weird, weird uniform as well. I don't think I'll ever be able to shake "(h)'ands on the (h)'ilt, stupid" from my life, as much as I try. Another dubbed effort, Andres Iniesta's turn in the Spanish form of Peter Lord and Jeff Newitt's film about Pirates. Again, and this really is a shame, I haven't seen either. But after watching snippets of the Spanish version, which included Iniesta's Albino Pirate character - and having heard the midfielder in interviews - I could not tell that it was him. I won't lie, it sounds nothing like him, and that's impressive... I think. Finally, we're getting to the big guns. This is A-grade stuff from ​Neymar, it really is. A one-on-one scene with Academy Award nominee Samuel L Jackson, some great dialogue and a wonderfully unique incorporation of his footballing talents. It's almost as good as it gets. I say almost, because there are some problems. Firstly, the Brazilian speaks in his native tongue while Jackson speaks in English, but both have no trouble understanding each other (bit weird). Secondly, there's got to be some doubt as to whether they even did the scene together, because they're never explicitly shown in the same shot. Oh well, he stops a robbery by kicking a napkin holder into the assailant's face, so who am I to nitpick. The start of Eric Cantona's acting career was a tough one. Placed alongside seasoned (and Awards garnering) performers such as Richard Attenborough, Geoffrey Rush and Cate Blanchett, the ethereal Frenchman struggled a bit. Just a bit. At least he looked the part, though. That incredible goatee is making a comeback, just you wait. Franck Leboeuf is genuinely, actually, sort of quite good in this James Marsh film. He holds his own in a pivotal scene with Felicity Jones (Jane Hawking), after Eddie Redmayne's Stephen Hawking suffers his life altering injury. Plus, the former Chelsea man speaks in French and English. That's got to count for something. He's now working in the Parisian West End, apparently. Bonne chance, Franck. 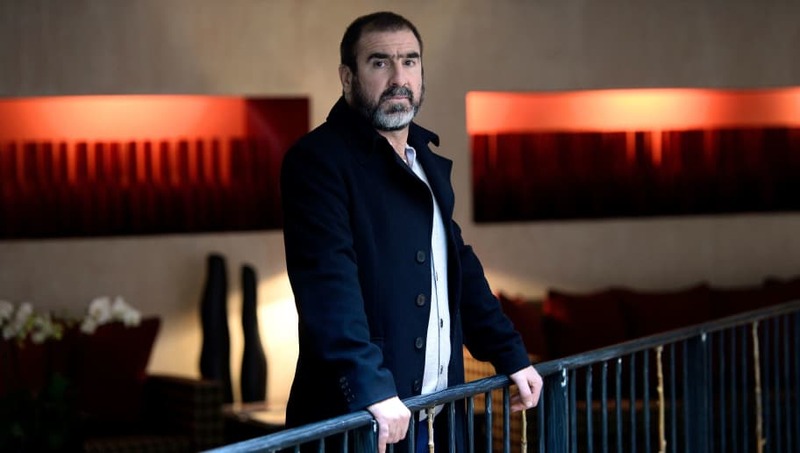 It's an obvious irony that Cantona is far better at playing an exaggeratedly poignant version of himself than he is at other people, but you can't deny that he's good in Ken Loach's touching film. It's like Matt LeBlanc in 'Episodes', only more French, and with lines like: "I am not a man, I am Cantona." John Huston's film is essentially the classier version of 'Torrente 4' (no offence to the Torrente franchise). Actually, that's a terrible analogy. Basically, if you haven't seen it, 'Escape to Victory' is probably the best film that depicts football with real footballers. But, crucially, Pele and Bobby Moore are actually acting (...well), because they are inhabiting Cpl. Louis Fernandez and Terry Brady respectively. Definitely worth a watch - Sylvester Stallone is a highly capable keeper and Pele, I mean Louis Fernandez, executes a fantastic overhead kick. It's undeniably a controversial choice, but it's actually the only choice when you really think about it. This is vintage stuff from Ally, it really is. Definitely the most meta of the lot, McCoist is playing to type as a footballer, but is also entangled in a complicated love affair with his new coach's daughter. The story is so convoluted it's hardly worth getting to, so let's just get to the relevant part - which is McCoist. In a film with such vaunted stars as Robert Duvall and Michael Keaton, the Scotsman is somehow probably the best actor in it. Duvall is speaking some unknown dialect that masks as Scottish, and Keaton's steep descent into ignominy started here. But McCoist... McCoist is like a highlander-Marlon Brando.